Dr. Charlene Monk, a native of Baltimore, MD, was born-again into the rich legacy of the Daughters of Thunder whose roots began in the Azusa Street Revival. Dr. Monk was greatly influenced by her pastor, Bishop Mother Rosa A. Horn. In her early years, Dr. Monk was anointed by the power of the Holy Spirit to preach the gospel of Jesus Christ. She has continued in this legacy, ministering for the past 38 years throughout the world. In June of 1981, Dr. Monk graduated from Coppin State College with a Bachelor of Science degree in Management Science. In May of 1985, she received her Master’s degree from the Howard University School of Divinity. In 1998, she received her Doctoral Degree from the Howard University School of Divinity. 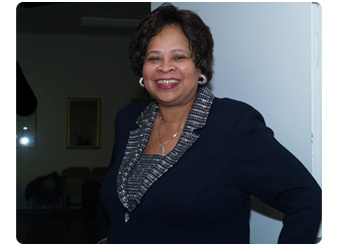 From 1990 to 1992, Dr. Monk served as Special Assistant for Religious Affairs in the Executive Office of the Mayor of the District of Columbia during the Sharon Pratt Kelly Administration. She also served as a member of the Interfaith Council under Mayor Anthony A. Williams’ Administration. From July 1986 to September 2005, she served as the pastor of the Douglas Memorial United Methodist Church, in Washington, DC. Dr. Monk preaches to the masses through her popular radio broadcast ministry, ”A Word for Today with Dr. Charlene Monk.” The powerful broadcast of over 16 years can be heard on WPRS/Praise 104.1FM, WYCB 1340AM and WOL 1450AM. On June 12, 2004, Dr. Monk opened the New Horizon Christian Faith Outreach Center in Mount Rainier, MD, an 867-seat theater style edifice, as a venue for live Christian services, entertainment, concerts, and educational programs. On September 15, 2005, Dr. Charlene Monk became pastor and founder of the New Horizon Christian Faith Church also located in Mount Rainier, MD. In 2006, Dr.Monk’s passion to help the community inspired her to launch the New Horizon Christian Faith Church’s community-based GED program. Dr. Monk is a trail blazer for the Kingdom of God. Dr.Monk’s preaching ministry has caused her to travel extensively across the United States and internationally to Ghana, Israel and the Bahamas. Under her dynamic leadership, God allowed her territory to expand as she launched the New Horizon Hall of Elegance and the New Horizon Hall of Missions in June 2008. In 2010, Dr. Monk’s desire to help families and the community led her to open the New Horizon Unique Boutique. It is her sincere desire to serve God and to serve others who are in need of natural and spiritual enrichment. Dr.Monk has a servant’s heart. In November 2014, the New Horizon Christian Faith Church launched a new entity known as the New Horizon Christian Faith Church International. The new entity serves as a spiritual covering to churches and ministries throughout the United States. Dr. Charlene Monk now serves as the Episcopal Presiding Prelate for the New Horizon Christian Faith Church International. The covering expands to the Beauty for Ashes Ministries of Charlotte, NC, Next Gener8ion Ministries of Maryland, the New Horizon Christian Faith Church of Woodbridge, VA and the New Horizon Christian Faith Church of Landover, MD. She leads by example in fulfilling the need, wherever the need may arise! On March 22, 2015, God’s favor allowed Dr.Monk to expand her territory and establish a second location in Woodbridge,Va. now known as the New Horizon Christian Faith Church of Woodbridge,VA. On February 21, 2016, under Dr.Monk’s impeccable leadership, the New Horizon Christian Faith Church in Maryland relocated to our new church in Landover, MD. God is using Dr. Charlene Monk to impact the nation as she serves humbly and with diligence to teach Kingdom principles and obey the great command of “Go ye into all the world, and preach the gospel to every creature,” Mark 16:15. Dr. Monk’s favorite scripture is “I can do all things through Christ which strengtheneth me” Philippians 4:13.